In September of 1998 U2 announced they would be releasing the first of three compilation albums. This first compilation would cover the recordings released between 1980 and 1990. “Sweetest Thing” was originally a B-side to “Where the Streets Have No Name” that had been released in 1987. 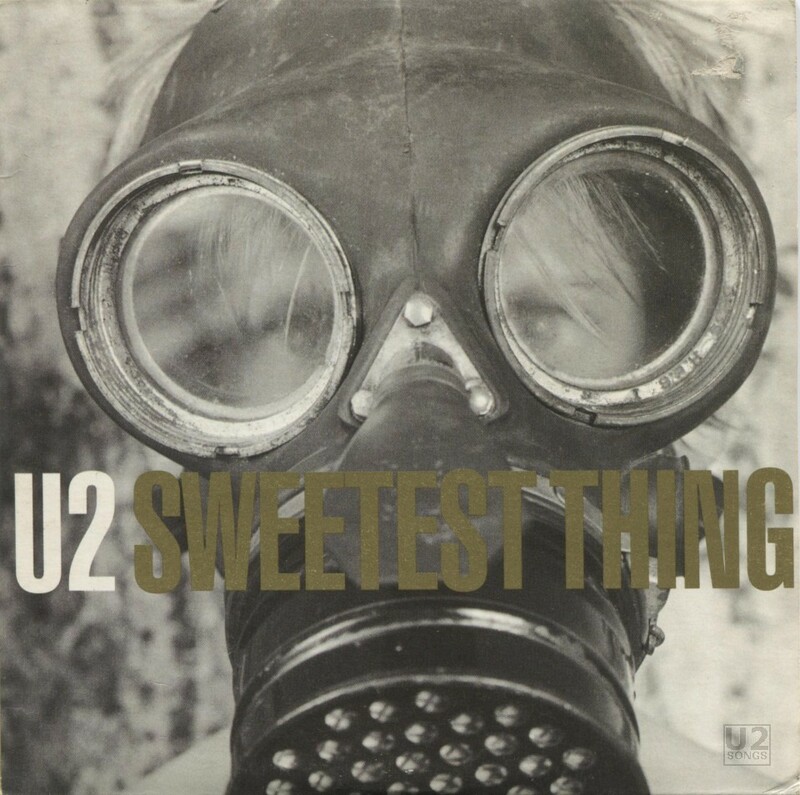 To promote the new compilation, U2 re-recorded “Sweetest Thing” and released it as a commercial single. The re-recorded version was also released on the compilation and the original recording of the song was featured on the B-side disc that was made available as a 2-disc set. The single was released on October 19th in most of the world, and October 20th in Canada. There was no commercial release of this single in the USA, but promotional releases were sent to radio to promote the track. Two versions of the single were released in most regions. Both contained live tracks taken from one of two concerts. One version of the single had tracks from a June 5, 1983 performance at Red Rocks in Denver, CO. Other songs from this performance are available on “Under a Blood Red Sky”. The other version of the single had tracks taken from a March 6, 1981 performance from Boston MA. Other songs from this performance were previous released on the Gloria single as well as on the Dancin’ Master compilation, and the whole performance was released as “Live from Boston 1981” as part of “The Complete U2” boxset through iTunes. A 3-Inch CD single was released in Japan which used the album version of “With or Without You” as the extra track. At the time a television show in Japan called “A Sleeping Forest” was using the track and a sticker on the sleeve mentioned that this track was appearing on the television show. The song was initially written for Bono’s wife Ali when he missed her birthday in 1986. U2 used that fact in the video for this song, as the video is set up to be one big apology from Bono to Ali. The video was directed by Kevin Godley and filmed in the streets of Dublin, along Fitzwilliam Place as well as Upper and Lower Fitzwilliam Street. The song featured Bono and his wife in a carriage, traveling along under banners professing he is sorry, while a street carnival atmosphere breaks out in the background as a way to apologize. Performers in the video include Boyzone (boy band), Macnas (performance troupe), Steve Collins (boxer), the Artane Boys Band, The Celtic Knights (male strippers), Jean Butler from Riverdance, as well as the rest of U2 following in an open top Mercedes behind the carriage. Elephants, classical musicians, trapeze artists, and firewalkers as well as friends and family of the band also appear. All proceeds from the song were given to the charity “The Children of Chernobyl”, which was chosen by Ali as her chosen charity, an organization that brought chidren affected by the Chernobyl disaster to visit and stay with Irish families. U2 first performed the song live in 2000, when receiving the “Freedom of Dublin City”. It was also played on many dates throughout the first and second legs of the Elevation Tour in 2001. The full song was not performed after the Elevation tour until 2015’s Innocence and Experience Tour. During that tour, the song was played at 21% of the concerts. “Sweetest Thing” also appeared on The Joshua Tree 2017 show for one night only ni Mexico City. The studio version of “Sweetest Thing” was also included on the compilation “18 Singles” released in 2006. The version included on that compilation was the re-recording from 1998. Produced by Steve Lillywhite with Daniel Lanois and Brian Eno. Recorded by Joe O’Herlihy and Pat McCarthy. Additional recording and mixing by Steve Harris. String arrangment by Daragh O’Toole. Strings: Una O’Kane, Nicola Cleary, Aengus O’Connor, Nicholas Milne. Special thanks to Ali Baba. With or Without You (Album Version): Produced by Daniel Lanois and Brian Eno. Engineered by Flood. Mixed by Steve Lillywhite.